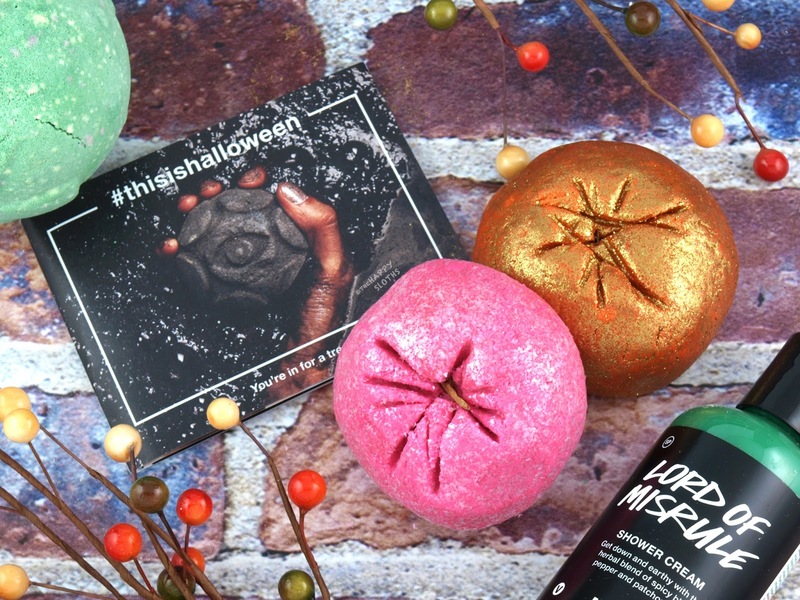 Hands down my favorite item out of the bunch, Lord of Misrule is a gorgeous green bath bomb packed with a hidden pink center. 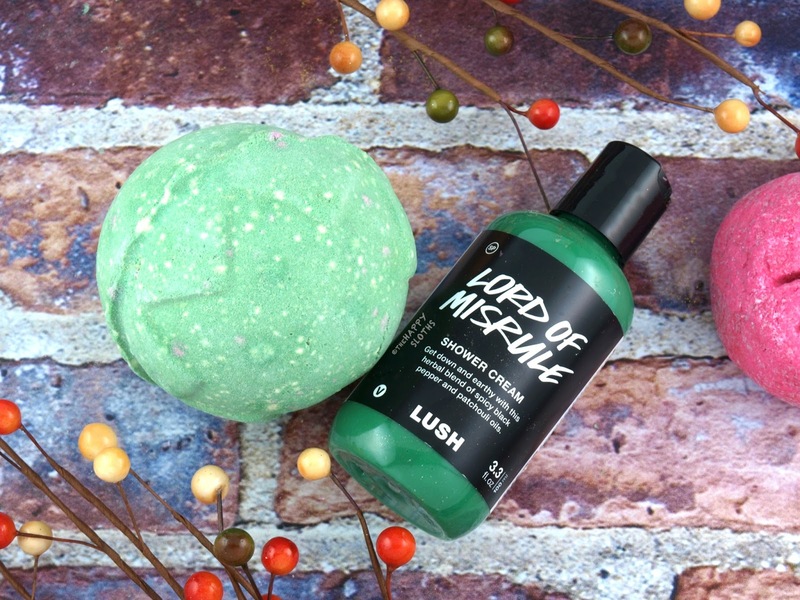 The bomb is infused with an intoxicating fragrance of patchouli and black pepper; if you like something spicy and earthy, they you are going to love Lord of Misrule! 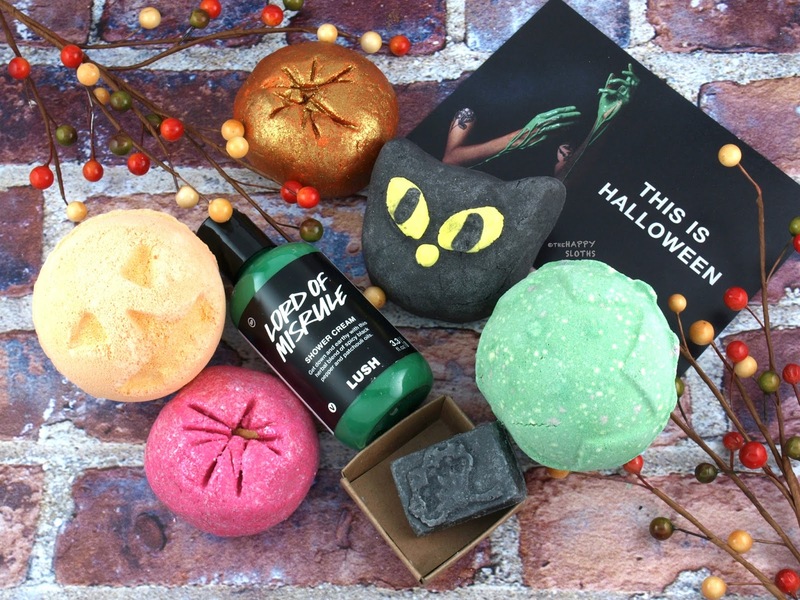 With a gloopy green appearance, the Lord of Misrule Shower Cream is a lovely body wash scented with the same warm and spicy fragrance as the Lord of Misrule Bath Bomb. The formulation lathers just fine and leaves the skin soft and moisturized (thanks to the organic cocoa butter). A Lush Halloween staple, Sparkly Pumpkin is a gorgeous shimmery bubble bar infused with oils of juniper berry, grapefruit, and lime. To use, crumble under hot running water and watch as your bathtub fills with luscious bubbles. If you are a fan of the original Sparkly Pumpkin, then get ready for a girly update with this bright pink version that's scented with geranium, bergamot, and jasmine. As Lush puts it, if you are more likely to dress up as a unicorn than a zombie, then the Pink Pumpkin is made for you! Shaped like an adorable jack-o'-lantern, Pumpkin is a festive orange bath bomb infused with the scent of pimento berry (allspice), vanilla, and cinnamon. If you like the warm and spicy fragrances of fall, then definitely give this one a whirl. 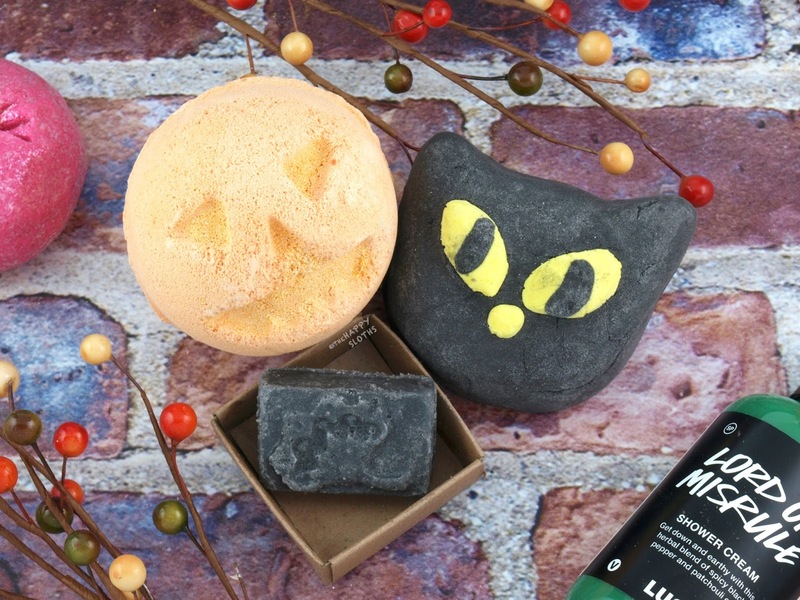 Inspired by the iconic symbol of Halloween, Bewitched is a bath bubble bar shaped like a black cat. Scented with bergamot and frankincense, this feline wonder will turn your bath water into a mysterious shade of black. Made with murumuru butter, coconut oil, and jojoba oil, this is a solid sugar lip scrub designed to gently exfoliate and condition the lips. I was a little skeptical at first since I've never tried a lip scrub "bar" before but this stuff works just as well as any regular lip scrub that comes in a jar. There is a good ratio of sugar and oil so while you get a great scrubbing action from the sugar, the oils lightly nourish without leaving behind a greasy residue. Additionally, because there are no loose sugar crystals flying around, the packaging format is actually a lot less messy and wasteful. Lastly, thanks to the spearmint oil, Black Rose is cooling and invigorating! If you are a fan of lip scrubs, definitely give this a go!